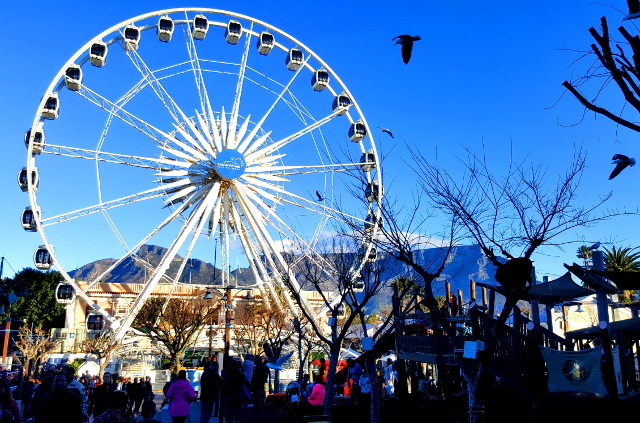 My collection of Cape Town photos was getting really long, so I've created a new page for all the photos in the Port of Cape Town. 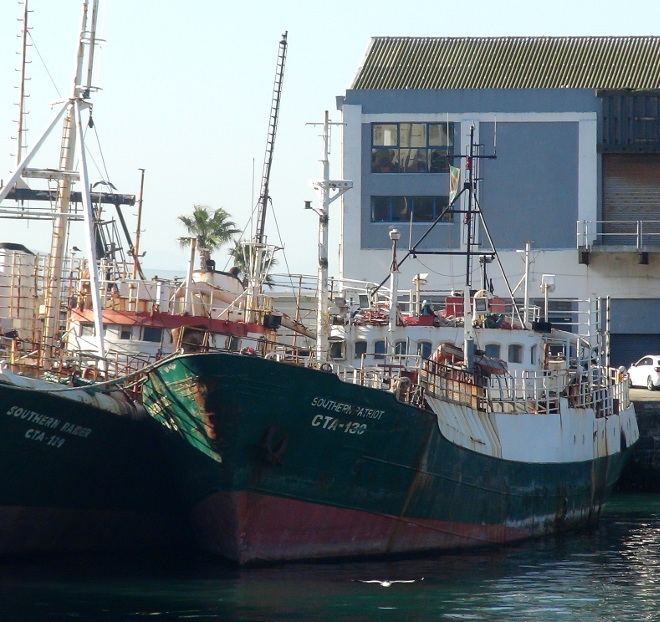 When you start & end your Cape Town cruise, keep a lookout for the fascinating vessels in the harbour. 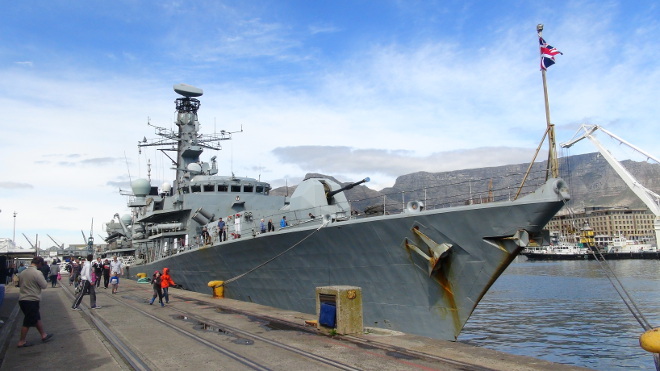 Here's the HMS Iron Duke, a British warship which docked opposite the Table Bay Hotel on the 23rd August 2014. 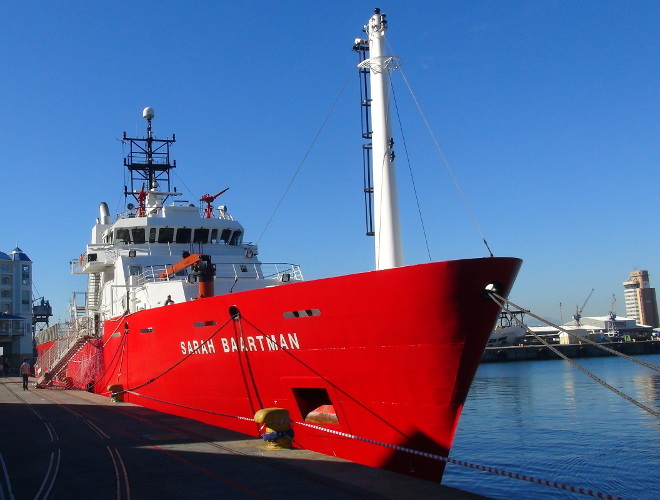 Here's the Sarah Baartman, an environmental protection ship, operated by the South Africa Department of Agriculture, Forestry & Fisheries. Stroll around on foot to get a feel of the Waterfront before going for a boat cruise. But be careful of pickpockets - ladies, do not leave your bag lying around whilst sitting at tables. Here's the swing bridge leading to the yellow Clocktower (which historically was the Port Captain's office). 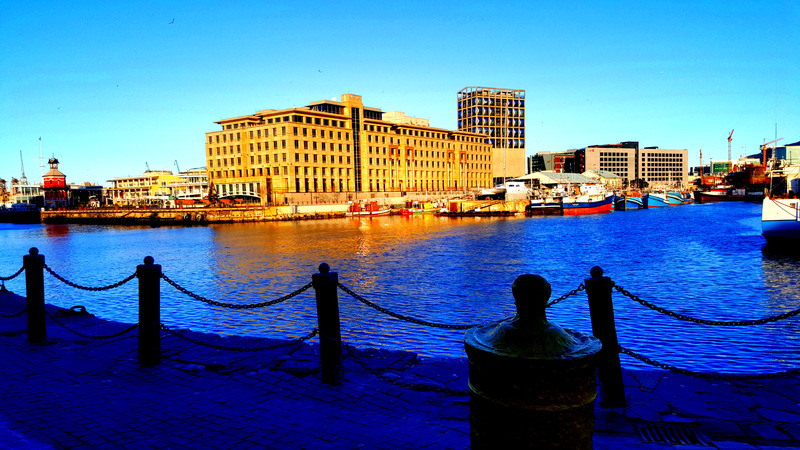 The swing bridge opens and closes to allow boats to go into the Victoria & Alfred Basin. And here's the Clock Tower Retail Centre at sunset:. We can see the clocktower on the left, and the tall building just to the right is the old grain silo (now refurbished), to the right of which are the silo districts and to the right of that there's still construction going on. 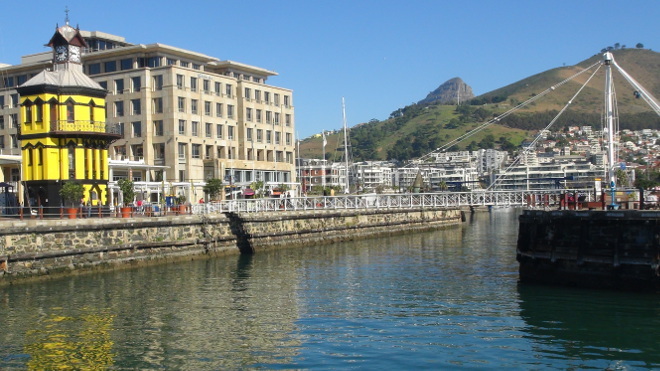 The V&A Waterfront has seen continuous development since 1990, when the only buildings now visible in this photo would have been the Clock Tower and the old grain silo. 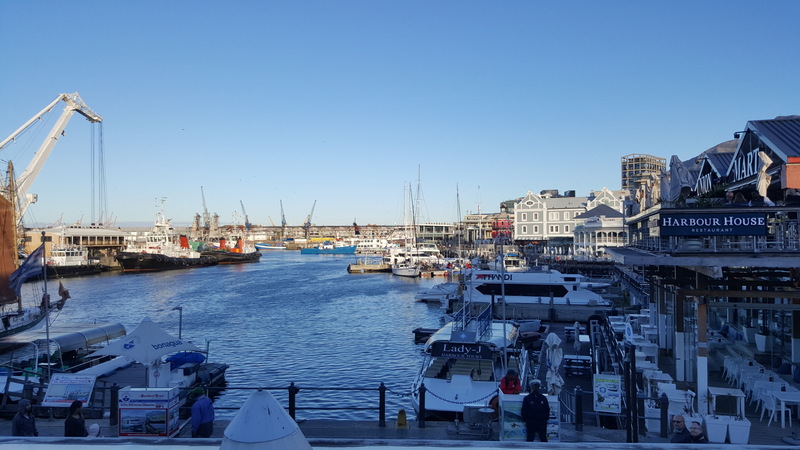 A visit to the V&A Waterfront is not complete without going for a boat ride. 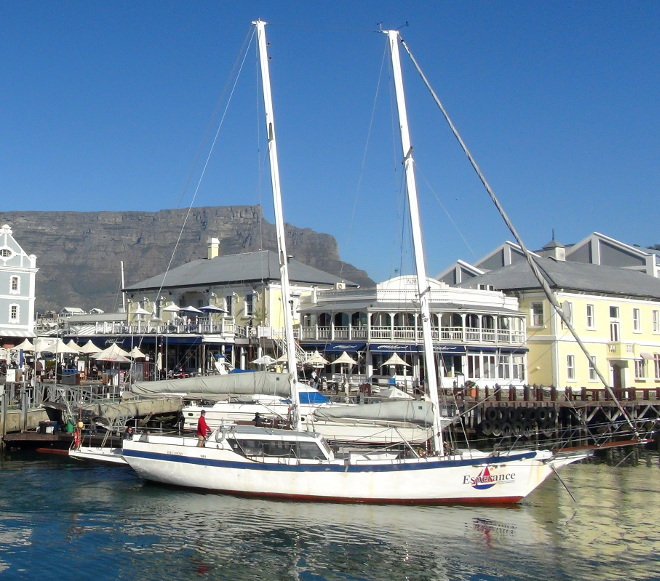 If you enjoy wind power over motors, the Esperance offers a sailing yacht experience, and the perfect sunset cruise experience. Phone 021-418-5821 to make a reservation. 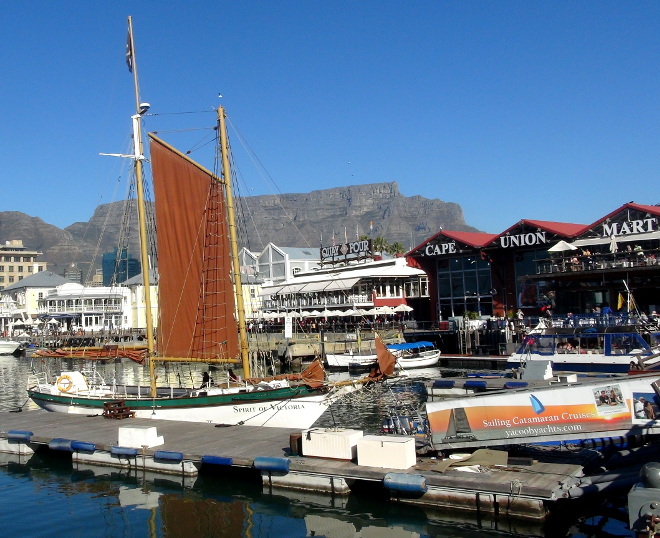 The Spirit of Victoria is a schooner based at the Victoria & Alfred Waterfront, and is perfect for those looking for a bit of wind-powered pleasure. 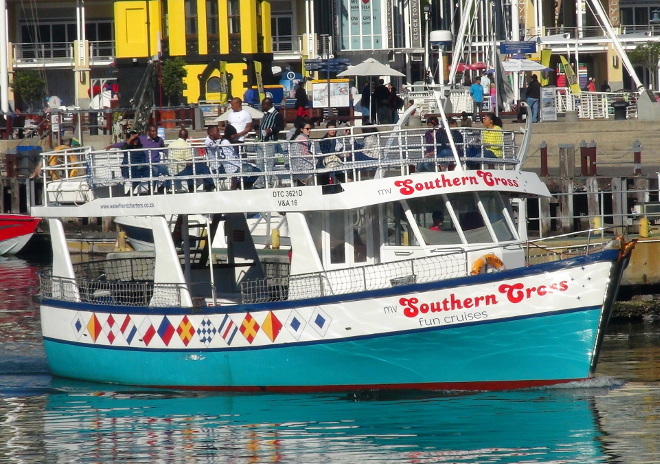 Southern Cross Fun Cruises, as the name suggests, offers pleasure boat rides. 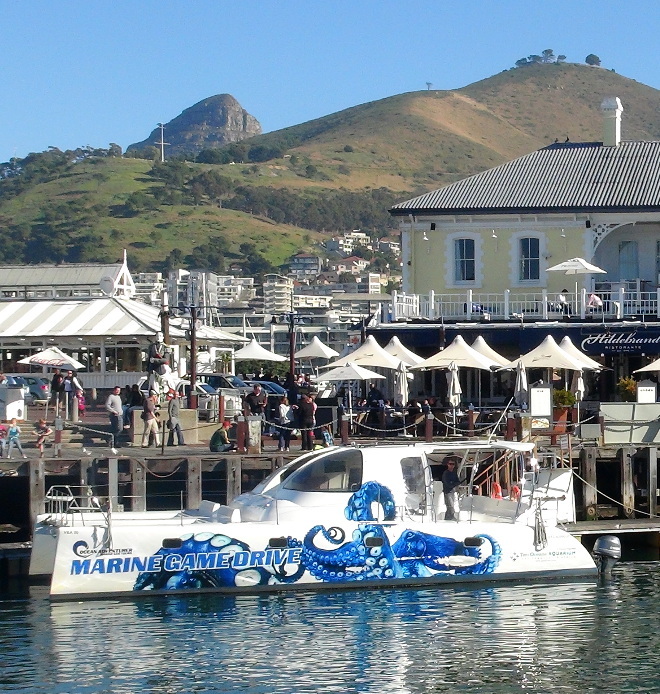 Phone 083-675-4043 to make a reservation. The Jolly Roger pirate boat is a favourite amongst the kids. They take you out of the harbour up close to Greenpoint lighthouse, and back. Along the way there's facepainting (choose a pirate moustache) and a pirate play is acted out. "I'm not Captain Hook, I'm Captain Crook" - the captain let me know! Here's a play on the traditional Kruger National Park type game drive - a marine game drive. 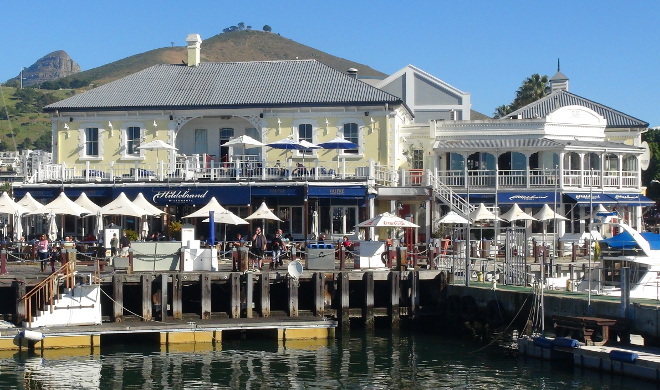 The Hildebrand Restaurant moved to its V&A Waterfront location in 1995. 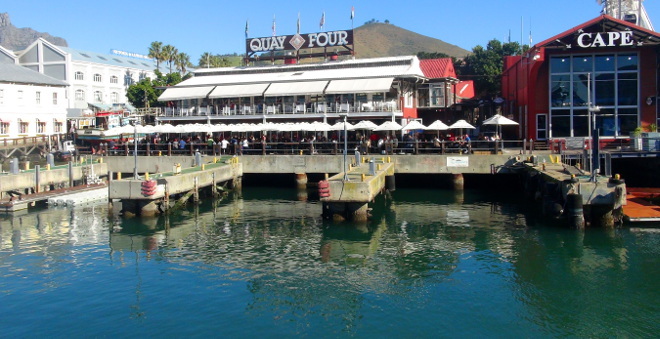 Quay Four is one of the iconic restaurants at the V&A Waterfront, and one of the first new spots created when the area was redeveloped in the early 1990s. 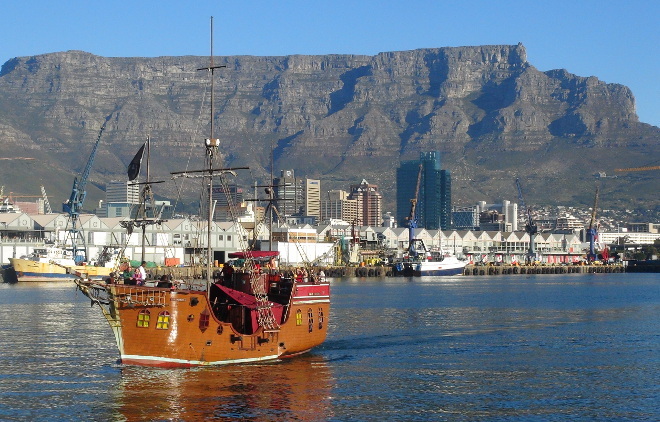 The Southern Patriot lobster boat, viewed in Cape Town harbour on the 17th June 2014. 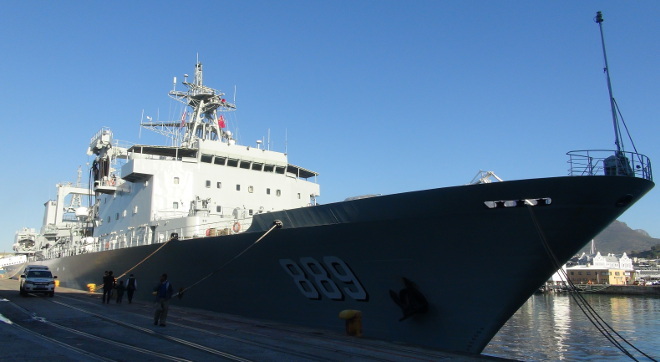 Alongside is her sister ship, the Southern Raider. 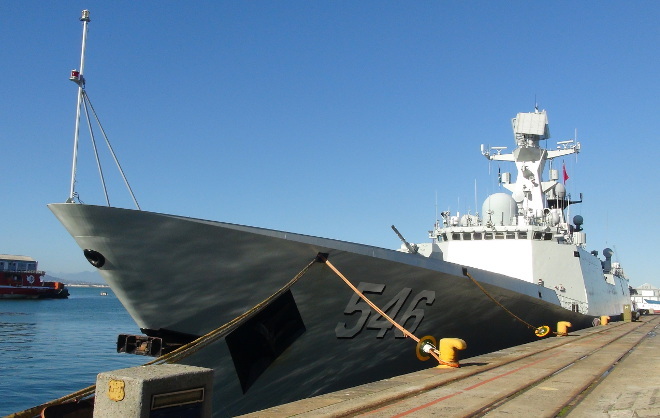 On the 17th June 2014 several naval ships from the People's Republic of China stopped at the quay opposite the Table Bay Hotel at the V&A Waterfront. 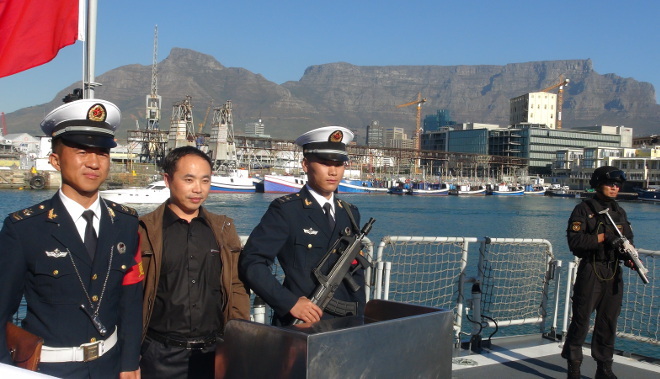 Chinese navy sailors on board the CNS Luoyang in Cape Town harbour (in the background you can see the old grain silo, which was South Africa's tallest building in the 1920s).